4 days tour, 3 days on the bike for no less than 300 km off road. Departure and arrival directly from your hotel. If we draw on a map the several path tracks that we drive daily, it would look like a daisy flower with a lot of petals and each one represents different tracks. The daisy with thousand petals, formed an endless series of tracks that overlap and intersect with each other, allowing Motobia to always be able to choose the right and funny itinerary for every riding level. Motobia Italy original dirt bike tour company, with 22 years experience, offer a real adventure! Get ready for the “Ride of Your Life!” Want to enjoy the thrill of the machine and a sense of discovery as you venture through some of Italy’s most stunning scenery? Experience the freedom and fresh air as you trailblaze ’round some of the country’s best off-road trails with our team. 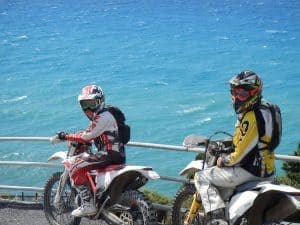 Based in San Lorenzo al Mare, Italy, we offer a range of all-inclusive dirt bike adventures. We supply top quality, well-maintained, latest model bikes, along with all the riding gear you need to have a truly exhilarating off-road experience! Plus our passionate local guides accompany each tour. Please specify your preferred dates in the request. We can organise your transfer to and from the Airport. By Car, see map below. If you have an Individual Requests please give us a call or write us an email. From the 4* Hotel Riviera Dei Fiori it is only a stroll along the port promenade to the center of the town of San Lorenzo al Mare and allows great access to restaurants, café’s and bars. It offers a wide range of services you would expect from 4* accommodation including direct access to the sea, a spa facility, free internet access and a stunning view along the coast. Dinner together in excellent typical Ligurian restaurants.